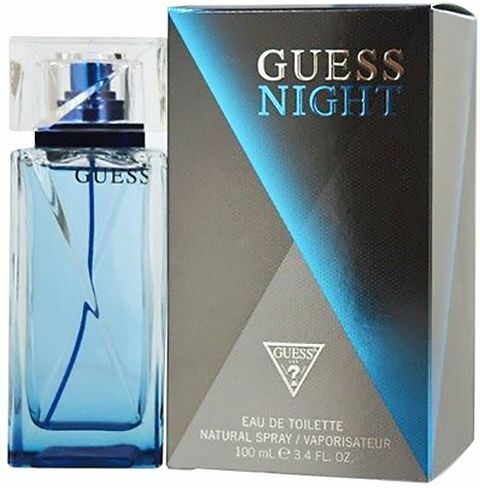 Night by Guess for Men is inspired by the pulsating vibes of electronic and dance music. The scent distills the energy of the young men of a downtown metropolis who are forever young at heart. Master perfumers Antoine Lie and Francis Kurkdjian have created this unique, fresh, woody Fougere fragrance from the essences of hot spices, aromatic extracts, and fragrant woods and mosses. It comes in a highly stylized 100ml glass flacon that is just as incredible as the fragrance itself. Bold cuts adorn this bottle that looks immensely dynamic. Night by Guess for Men begins with its symphony of hot pepper, aromatic elemi, tart, tangy grapefruit. The top notes evoke a spicy, uplifting aroma that is very tempting. The heart of Night by Guess for Men is composed of woody cedar, vetiver, and rosy, lemony geranium. The enchanting woody floral rhythm is sure to make heads turn everywhere you go. The base of Night by Guess for Men illuminates your senses with woody essences of patchouli, mysterious and sensual black vanilla, and leathery, ambery labdanum. It leaves a lasting trail that is soothing to your senses as well as of those around you. Guess Night Vaporisateur is one of the best releases of the brand. Very refreshing and rich smell. Long lasting fragrance which most importantly does not stain the shirts. I get compliments at work and college due to its sweet and refreshing smell. Great perfume for daily use. Refreshing and rich smell which is very long lasting. Not Long Lasting. Just 2 hours and smell vanishes as if you have not applied it at all. Do not buy instead Rasasi Hatem is much much better in this range Souq delivery is very quick.